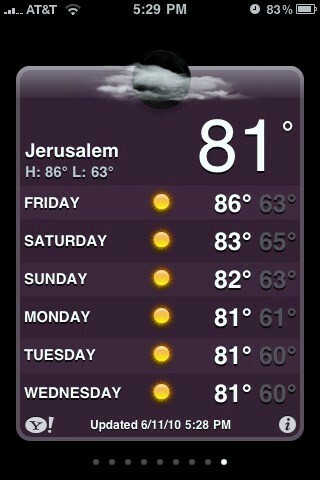 Do East and West Jerusalem Have the Same Weather? It's curious how much trouble weather listings can cause. 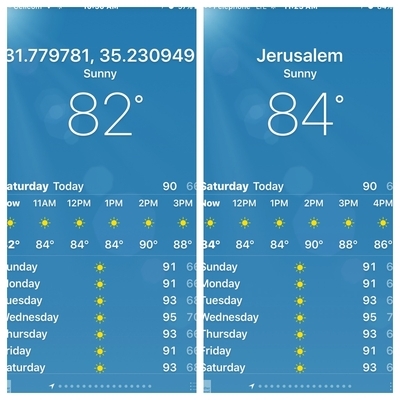 Jerusalem's status confuses diplomats, so how are weathermen to be able to figure out its complexities? This weblog entry follows the weather of the eastern and western parts of Israel's capital city. Yahoo! 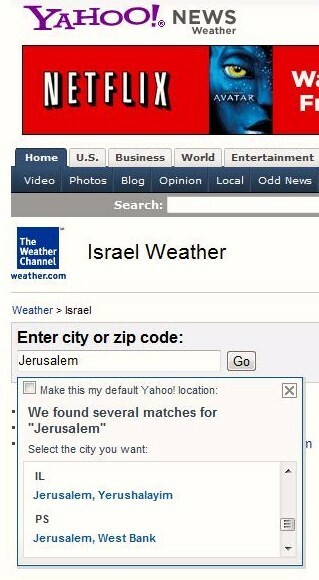 weather service for Jerusalem. June 10, 2010 update: HonestReporting.com notes at "Yahoo Divides Jerusalem" that one year later, Yahoo! 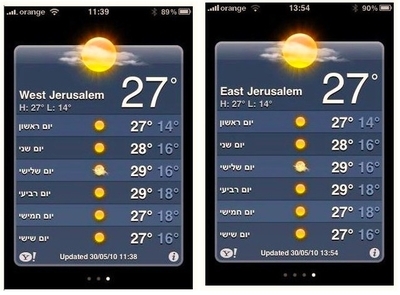 has gone a step further on the iPhone and offers separate weather reports for East Jerusalem and West Jerusalem, though with the days of the week in Hebrew for both. June 11, 2010 update: My iPhone shows a single Jerusalem, which it unequivocally lists as "Jerusalem, Yerushalayim (Israel)." There is no listing under "Al-Quds." June 16, 2010 update: HonestReporting.com reports that Yahoo! Has gone back to a single listing for Jerusalem. Sep. 25, 2012 update: Yahoo! 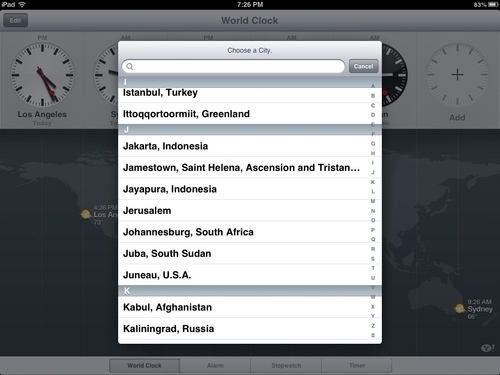 provides weather information to Apple's new iOS6 weather app and it lists Jerusalem, and Jerusalem alone, without an affiliated country. July 9, 2016 update: In a new twist on Yahoo! 's weather information for the iPhone, eastern Jerusalem turns up as longitude and latitude while western Jerusalem is "Jerusalem." Here are two screen shots from my iPhone, taken a half hour apart. 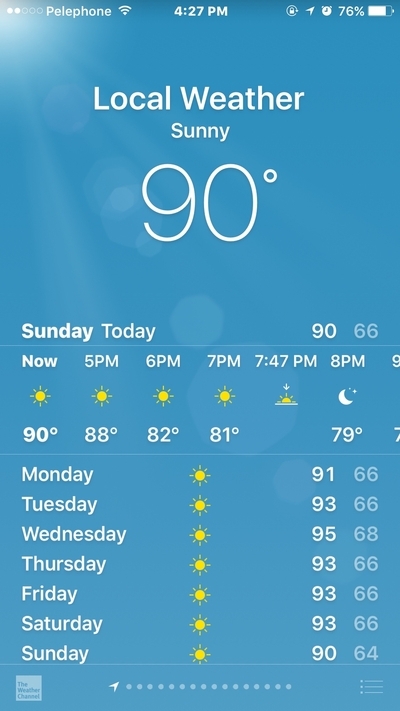 July 10, 2016 update: A day later, another Jerusalem irregularity on the iPhone's weather feature, something found nowhere in the world, at least in my experience.